PREVIEWS | RAISE YOUR HANDS! KOREAN HOUSE MAFIA! Mitomi Tokoto is the producer of the well known website CYBERJAPAN and also one of the top DJ/Producer/Remixer in Japan from David Guetta,Axwell to Koda Kumi, Daishi Dance… Mitomi Tokoto is currently the most selled Japanese House Music Producer on Beatport with 4 tracks in the Beatport Top100 and 2 tracks in the Beatport Top10 (That Ibiza Track, Sax@Arena)! Collaboration track between MITOMI TOKOTO and the Japanese Newcomers Duo JAPAN HOUSE MAFIA! Coming at the end of the year on Taku Takahashi (m-flo) Label “TCY Recordings”. ‘Titanium‘ – production from David Guetta with incredible Sia‘s vocal still destroy dancefloors. But also ‘Titanium‘ is a good material for remixing. Two weeks ago we wrote about amazing remix from Gregori Klosman, and today is time for next remix from famous artist – Nicky Romero. For sure, everyone knows Nicky. He made many good tracks, such as ‘Beta‘ with Hardwell, ‘Sliced‘ with Bingo Players or ‘Camorra’. But go back to the heart of the matter… Nicky made a really good version of ‘Titanium‘, in his style. I like it so much. And what you think about his remix? Like it? Unfortunately, we don’t have release info, so you must stay tuned! Just to refresh your memory, Swedish House Mafia will be playing in the legendaryMadison Square Garden on December 16th 2011 and also in the gigantic renowned Milton Keynes Bowl in England on July 14th 2012! They did this announcement after revealing some clues during their gigs! Here are some information concerning tickets. Don’t forget to grab your copy of the wonderful take over on BBC Radio1 with Pete Tong during his weekly show Essential Selection. Also, we recently published the live set from Steve Angello at Club Glow in Washington DC. Don’t hesitate to grab your copy! Following our exclusive interview with Hardwell after his Electric ZOO live show, the Dutch DJ/Producer unleashed a big information : A new collab with Tiesto is on the way, so at the beginning of September we believed that Munster was this famous new track. We have finally got the answer thanks to a BBC Radio 1 show and the amazingHardwell‘s performance at the Sensation Innerspace @ Copenhagen in Denmark. Indeed, Hardwell played some brand new tracks never heard before. After, so many success with Beta produced alongside Nicky Romero, The World and of course the huge Cobra, Hardwell has just shared lots of new track title played at Sensation Innerspace such as Spaceman, Kontiki andMunster ! Hardwell joined forces with the 23 years old dutch producer Joeysuki to produce this nice track named including a fat bass line with famous synth already used in Zero76 with Tiesto. This banger is going to be out in Novembrer 14th through Hardwell own imprint Revealed Recordings. Hardwell returns with yet another single after his latest release Cobra on his own labelRevealed Recordings. Hardwell has had a great year starting it with the release of his collaboration with Tiesto to produce Zero 76and his own single Encoded. With his year kick started, he continued working to capitalize on the success he has. After touring with Tiesto in the United States,Hardwell was asked to play in Sensation White, and there he previewed his next single called The World which came in on his own brand Reveled Recordings in July. A bunch on remixes include his remix to DJ Fresh’s track Louder which he turned from Dupstep to a club banger, In the Air by Morgan Paige & Ned Shepard & many others. Then in September he came out with a huge collaboration on Spinnin Records with Nicky Romero called Beta, and his latest single was just released called Cobra which shows a new signature Hardwell sound. Now he gives usSpaceman which a combination between the old Hardwell sound and the new sound, the track will be out soon on his own imprint Reveled Recordings soon. Thomas Gold is back with yet another remix for Adele this time joining with the likes ofMark Mendes! Thomas is having a great year in the music industry with all the tracks and support he’s been getting from other artists. He started off the year hot off the release of his remix to Mogual’s track We Want Your Soul and his single AGORa both on Steve Angello’s Size Records. Then two huge tracks were released, the Thomas Gold & Axwell remix to Blow Up by Hard Rock Sofa & St. Brothers on Axwell’s own print Axtone Records, his Thomas own take on Jes‘ single Awaken on Ultra. After if he then came out with an insane remix to Lady Gaga’s track Judas alongside R3hab and other artists. Then later in the year he came out with two great remixes in the same day, one for Sander Van Doorn’s anthem Reach Out which came out on Sanders imprint DoornRecords, and a remix for Adele’s track Set Fire To The Rain on XL Recordings. He then met up with someone by the name of Dirty South to produce the track Alive which came out onDirty South’s label Phazing Records, which now features a Tommy Trash remix, and with his latest release, a rework of Marsch Marsch, the versatileness of Thomas Gold is on a new level. Thomas Gold also has a couple tracks in the vault including Sing 2 Me coming out soon on Axtone, and a brand new track with Dirty South! Check out the preview for this beautiful track coming out soon on XL Recordings. Skrillex, the leading producer of dubstep, has done it again! This time, it’s a HUGE collaboration with classic rock group The Doors for a new major motion picture coming out soon called RE:GENERATION. 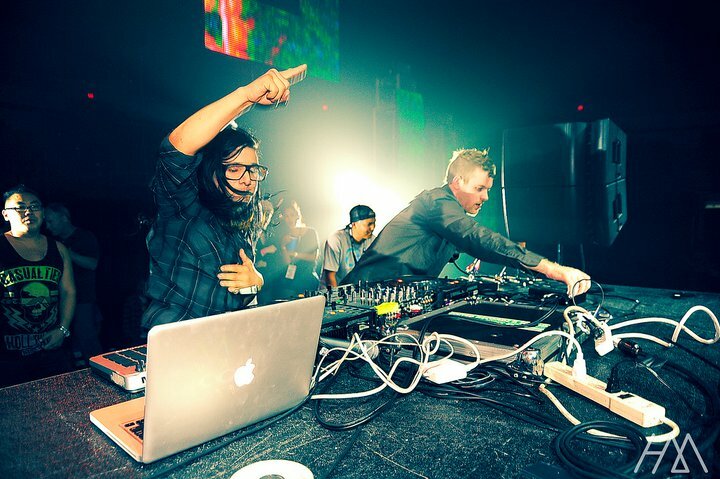 Breakn’ a Sweat has both the dubstep and glitch elements that Skrillex is known for, plus the classic rock elements such as keyboard, drums, and guitar of The Doors. The vocals are a cross between surviving members ofThe Doors and the king of dubstep himself,Skrillex. Catch this song onSkrillex’s current Mothership Invasion Tour! Keep an eye out for this movie coming soon, as it will involve more famous DJs and producers, such as Pretty Lights, Mark Ronson, The Crystal Method, and DJ Premier, collaborating with other artists and music genres to make new sounds!